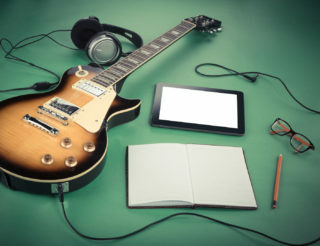 Any guitar teacher will tell you, especially after teaching for awhile, we tend to create a mental check list of things to always look for when working with beginning guitar players, young or old. For this post, I wanted to break some of the most common ones down. This list could potentially go on infinitely, especially when we start talking about some of the finer details with advanced students, but today we’re just going to cover the most typical problems for beginners. Any guitar player who is learning their instrument could come back to this to make sure they’re not building any bad habits. Try using the curves of the guitar to your advantage – they’re there for a reason. One curve should fit comfortable on your thigh, and the other should barely cup your ribcage. Now, every guitar is different, and every body is different, so these won’t always be a perfect fit, but it’s a starting point. Far too often do we guitar teachers see people who are only able to hold on to their axe by the neck because the rest of the guitar isn’t pressed against them, and is therefore slipping away. Again, this only is going to add unneeded complication. Have your elbow connect with the top corner of the guitar farthest away from the neck –This will secure the guitar against you and help prevent the guitar slipping and sliding around. Don’t tilt the guitar back towards you so that you can see – This is a dangerous slope. Especially with kids, this ends up being the guitar basically laying flat across your lap, which is definitely not what we want. If you have to tilt a slight amount at the beginning to place your fingers, that’s understandable, but then you have to start letting your fingers find the appropriate frets from there. 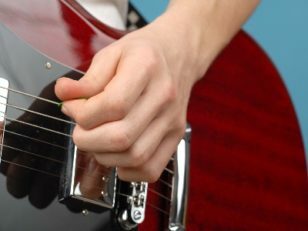 This is a bad habit that can be harmful later on down the road, and can also lead to the guitar sliding around too much. Tuning the guitar at the beginning isn’t always the easiest thing. It can take some getting used to and be a little time consuming. It is, however, extremely important for your development as a guitar player overall. Guitar players, at the end of the day, are musicians. The tool we use to create music just so happens to be the guitar. Any musician who doesn’t have a developed ear is going to have some difficulties down the road, and not tuning your guitar and therefore not learning to differentiate not-so-good sounds vs. good sounds is a one way ticket to this destination. Use the free mobile guitar tuner that comes with the Uberchord App. Eventually, you’ll be able to tune up a guitar in a matter of seconds and it won’t be a big deal anyway, so take the time now to ensure you don’t possibly harm your overall musicianship in the future. Trust me – it’s worth it. Even a pretty soft touch with our right hand can get a pretty big sound. A lot of beginning students hit their guitar with everything they’ve got, and the end result sounds really harsh and sharp. 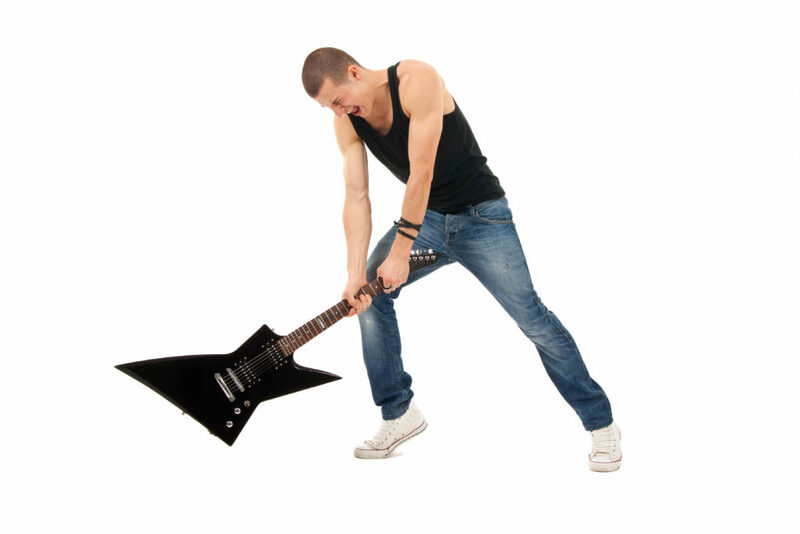 Later on, when you do want to rock star out on your guitar, the technique you use is actually the same as when you play soft, but just with more force. Getting your overall technique down first is vital, and strumming softly is what will help you with that. Alternate picking (going down and up through a string with your pick rather than in just one direction) is absolutely vital to your guitar playing success down the road. Unfortunately, even though it makes more logistical sense, it doesn’t really come naturally. I would say 9 out of 10 students instinctively only want to use downstrokes in the beginning. However, it is much harder to break a habit than start a new one, so take the extra step, and every time you’re learning something in the beginning, make sure you’re picking correctly. Eventually, this will become habit, you won’t have to think about it at all, and your progress will take off. Doing this earlier on is much better than basically re-teaching yourself later when you’ve taken your one directional picking to its brink. This is really tricky for a lot of people, especially for the young ones. People are often surprised by how hard they have to press on a string to get it to sound correctly. Again, this is a habit we need to develop as early as possible. Uberchord App is available for free download. It listens to you when you play guitar chords through your phone’s microphone and provides instant feedback. Use it! It may seem like all of your favorite guitar players aren’t pressing down very hard, but this is only because their fingers have gotten strong enough and comfortable enough with their instrument that they can press hard with a fair amount of ease. Be careful though-often times focusing on pressing too hard with your left hand sometimes makes you want to hit hard with your right hand as well, which we don’t want (see above). Also, if your guitar seems to be sounding too hard or out of tune, you may be pressing TOO hard and accidentally bending the string, or pushing the string so far below the fret it changes pitch. Find your balance and eventually it will become an instinct. To get the best tone, we want to have our fingers as close to the fret as possible, but getting your finger right on the fret (the metal line) is going to give you a pretty nasty buzzing or clicking sound. 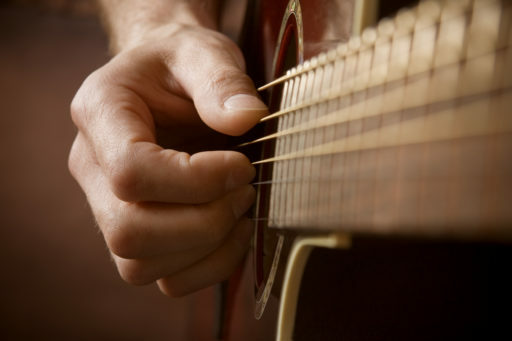 The guitar makes notes by shortening or lengthening strings depending on where the string is being bent on both sides. When you hit an open string, the string is bending down at the bridge and at the nut (you can see this for yourself) and therefore making a particular length of string for that note. When we fret notes on the guitar, the string is still being bent down at the bridge, but is now being bent at the desired fret as opposed to the nut, therefore shortening the string and making a higher note. 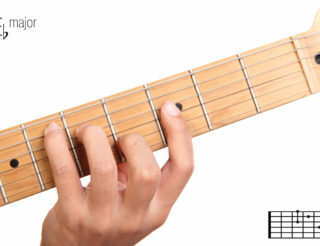 If your finger is directly on the fret, the string won’t bend over it, and end up just choking the string out. Again, your finger placement will eventually become instinctual, but take the time to really nail it now before you develop some bad habits. Every guitar player deals with strings being deadened whenever we’re working on our chords. Often times, people immediately assume this is from them not pressing hard enough. Sometimes, this is indeed the case, but more often, the string is actually not being allowed to vibrate (and therefore make a beautiful sound) because one of the fingers in your chord shape is touching it. An easy way to tell is if you take a finger off from your chord shape and all of a sudden that problem note sounds just fine. The trick to this is getting your fingers right on their tips, so that they don’t flatten out and touch other strings. This again, can be very tricky, and will take some time, but experiment with your fingers and where your thumb is to get a nice curve in those fingers. There are plenty of things that we can talk about, but these are definitely the most common technical problems I see as a guitar teacher. If you’re having some issues at the beginning of your guitar playing journey, refer back to this and see if you can fix them earlier rather than later. Learning anything is just about getting comfortable with it and developing good habits to pull whatever it is that you’re trying to learn off. Guitar is no different. Master these fundamentals and you’ll be reaching your goals in no time. Mike Lowden has been playing the guitar for as long as he can remember, and enjoys playing every type of music that he can get his hands on. Mike has education from the Berklee College of Music, and studied Jazz at the University of Akron. true facts and mistakes. I usually went through these mistakes while I was a beginner. 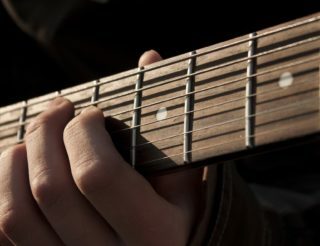 If you’re looking to find best beginner guitar do not forget to visit http://www.guitarable.com/best-beginner-guitar to find out the best.